Fitment: 1966-'84 HD® Big Twins. 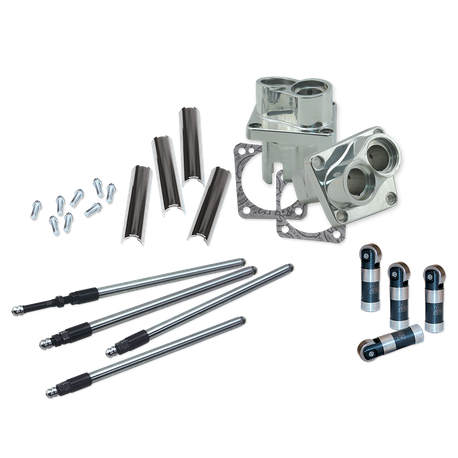 Convert any shovelhead engine to a quiet, dependable 1984-'99 style hydraulic valve train. Special polished billet tappet guides allow the use of late style tappets (included) and 198-'99 style cams. S&S® Quickee pushrods can be installed quickly and easily. Top end oil can be fed through the pushrods if the engine is equipped with S&S® roller rocker arms, or through the stock external oil line if using stock style rocker arms. Order the appropriate kit. 1984-’99 cams must be used with this kit to ensure correct valve timing. These cams are not included with the kit. Refer to page 5-20 for S&S camshaft recommendations to be used with this kit. If sourcing cams from another manufacturer, note that timing specifications will be unchanged, but the actual lift will be about 9% lower than specified due to the difference in rocker arm ratio. S&S billet tappet guides for shovelhead engines are similar in design to S&S tappet guides for 1984-’99 big twin engines. For that reason, they are not a direct replacement for stock parts, but must be used in conjunction with S&S tappets and cams for 1984-'99 big twin engines. Tappet bore geometry is corrected to compensate for the difference in pushrod angles between the engine types in order to maintain specified valve event timing. When selecting a cam, keep in mind that timing specifications will be the same as shown for 1984-'99 engines, but there will be about a 9% reduction in valve lift due to the lower shovelhead rocker arm ratio.